The below Betfred promo is a no brainer really as there is absolutely no risk! If you lose your bet, you get the bet refunded as a free bet! 1. Stake £2 on Scoop6soccer on Thursday 8th or Friday 9th October and get a £2 free Football bet on Saturday 10th October. 2. For every £2 staked on Scoop6soccer we’ll give you a £2 free Football bet. Max free bet awarded £10. 3. Free bet valid for 7 days after issue. Any free bet amount left unused after this period will be removed. 4. Promotion only valid on Betfred.com , Betfred.mobi, Totesport.com & Totesport.mobi during the qualifying period of Thursday 8th – Friday 9th October. 5. Free Bets will be credited before 12 pm on Saturday 10th October. 6. The free bet must be used on Football. 7. There is no cash alternative. 8. Free bets can be used only on fixed odds Football markets and cannot be used on any other products, Ie Casino, Games, Pools, Lotto, Bingo, Poker. 9. Please note that by taking part in this promotion you may be asked to take part in publicity. 10.Cannot be used in conjunction with any other offer. 11. Betfred reserve the right to exclude certain customers from this offer at their discretion. 12. Usual betfred.com rules apply, see website for details. 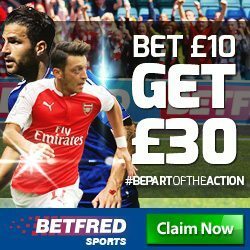 Click here to open your new account at Betfred and participate in this limited time offer! Read our review of the initial signup Betfred promotion code and welcome bonus here.